08/08/07 A190. 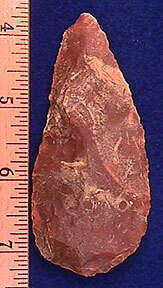 (A184) Blade, 3 5/8", Marion Co., FL, partially translucent with fossil inclusions, ex-Cliff Duvall, good workmanship with a small stack on the backside, good size and displays well, small modern flake off the tip, $15. PRICE REDUCED TO $9. 06/03/07 A191. (A186) Archiac blade, 3 7/16", OH pretty mottled grays and black, thin and very well made, $35. PRICE REDUCED TO $25. 06/03/07 A192. 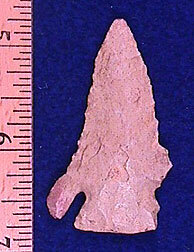 (A187) Preform\blade, 4 1/2", found by Ross Fletcher, Shelby Co., IN, pink and tan, nice big example, $10. PRICE REDUCED TO $7. 09/17/05 A193. 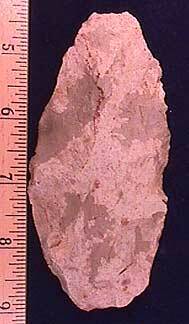 (A189) Savannah River, 2 3/4", GA, pink Coastal chert, ex-Ken Partain, Sisemore collections, $39. PRICE REDUCED TO $29. 08/20/05 A194. 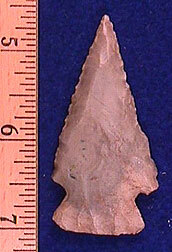 (A192) Kirk corner notch, 2 7/16", KY, hornstone, super edge work with a needle tip, $35. PRICE REDUCED TO $20. 08/20/05 A195. 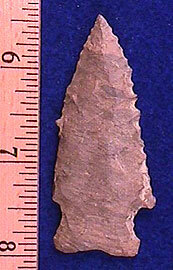 (A193)Stilwell, 2 1/2", KY, hornstone, finely made, $39, PRICE REDUCED TO $29. 08/20/05 A196. 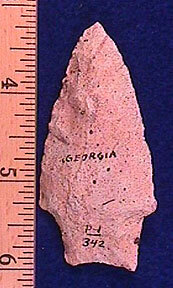 (A194) Pickwick, 2 15/16", GA, colorful orange and golden brown, very fine edge work, $25. PRICE REDUCED TO $19. 09/07/04 A197. 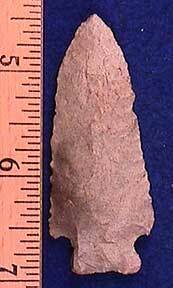 (A195) Pinetree, 2 9/16", TN, Dover chert, killer serrations with a needle tip, $35. PRICE REDUCED TO $27. 05/18/0 A198. 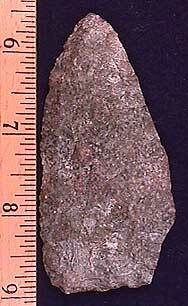 (A196) Lost Lake, 1 15/16", Scott Co., KY, Ft Payne, a well made, well used example, no modern damage, $15. PRICE REDUCED TO $9. 01/03/04 A199. (A197). 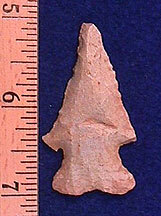 Pinetree, 2 1/8", KY, Ft. Payne, another heart-breaker, ear and base broken in ancient times, $29. PRICE REDUCED TO $19. 10/01/00 A200. 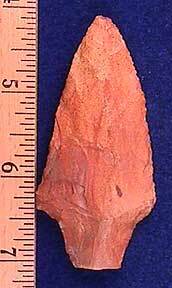 (A150) REDUCED Hickory Ridge, 2 9/16", MO, mottled pink and red, ex-Ken Partain collection, very well made, $59. REDUCED TO $49. NOW $39. PRICE REDUCED TO $29.